I am thoroughly enjoying all of my projects on the needles when I do sit and knit. This week is a busy one since we are approaching Easter. I am nearly ready, I even finished the secret project knitting. Hopefully I can share that soon. I'm terrible at keeping secrets, so you must know how challenged I am right now. Anyways- let's talk about knitting! 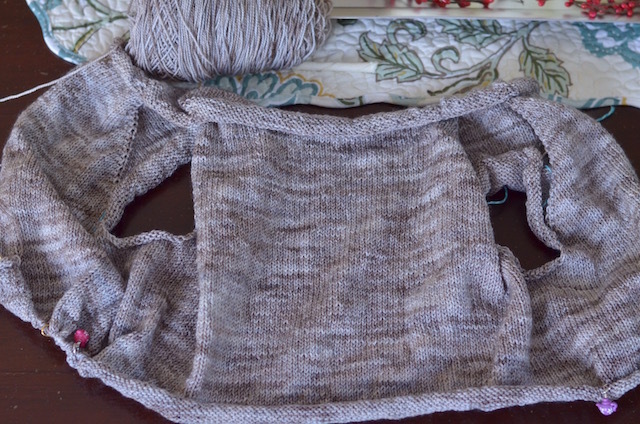 I'm finished with the decreasing of the body of the sweater and now am working on the increasing before I get to the finished edge. I'm contemplating on doing a simple rib edging instead of my icord edging that I've done on the two previous sweaters. I guess I'm up for a different look. The cardigan is super squishy and soft. Madeline Tosh Sock is a fabulous yarn! I did reach the lace edging of my dandelion field shawl (a.k.a. pebble beach shawl). This yarn is soft and has the slightest of haze, light and airy. I'm anticipating finishing this project over the weekend. Assuming I'm not talking on and on with relatives. 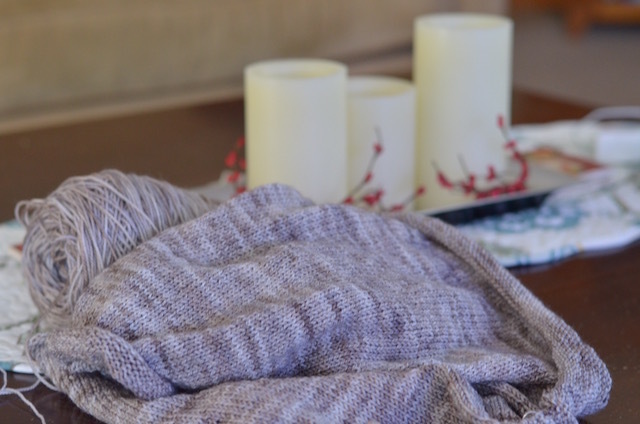 Both projects are comfort knitting- they are easy and relaxing and you know what you are doing when sit down to knit. No surprises or odd questionable directions! I really appreciate Madeline Tosh colors and think your cardigan is going to be quite special. 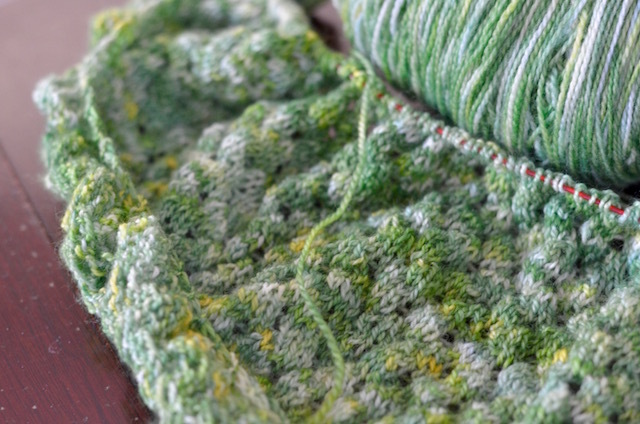 I also love the colors in your perfectly named dandelion field shawl; that's exactly what my lawn is starting to look like and I love the cheery yellow and green combination. Happy knitting and Happy Easter! Isn't it wonderful to have projects like that ...easy to do, but oh, so enjoyable! I am currently crocheting a baby afghan for our niece who is having a baby boy in July. It is like that...easy to pick up when I have the time and easy to talk while doing so. Both your cardigan and your shawl are beautiful, Karen. Both projects are lovely. Comfort knitting is the best!! Happy Easter. Sounds simply divine. Please do enjoy the upcoming holiday with your family. I am keeping it simple this year! What lovely knitting ... comforting, I imagine, not just for simplicty, but for those gorgeous spring colors! Those yarns both look so soft and squishy. Happy Easter and happy knitting! Both of these projects are so pretty. I really love the yarn you are using for the shawl. Happy Easter! Both of your projects are the perfect color for spring! : ) I have a question for you. 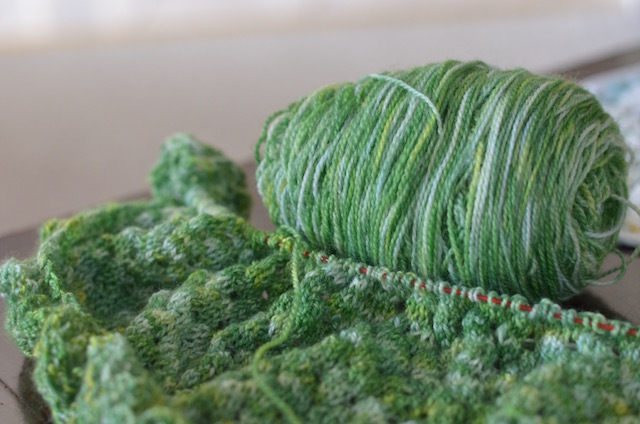 I would like to knit a baby blanket with some fingerling yarn I purchased from Amanda (@littlehousebigwoods), do you know of any easy pattern that would work? The yarn is fingerling weight. nothing better than madeline tosh!!! lucky you!!! lovely colours, too. enjoy the family time this weekend!!! Your shawl looks so like spring - gorgeous! Have a lovely Easter with lots of knitting time. Beautiful knitting and yarn. I love that green. Happy Easter! Your sweater looks just lovely! The color of yarn that you chose for it is wonderful. Great progress! And thank you for your sweet comment about my cards; it made me smile. I really do try to think about the recipient and what about him or her I'm inspired by in relation to the card layout. Thank you for noticing. Madelinetosh yarns are so nice to knit with. Your sweater will be a great weight for a spring day. I'm behind the times but I sure like the look of the purple gradient yarns. Happy Easter. beautiful projects and the yarn looks so lovely also..